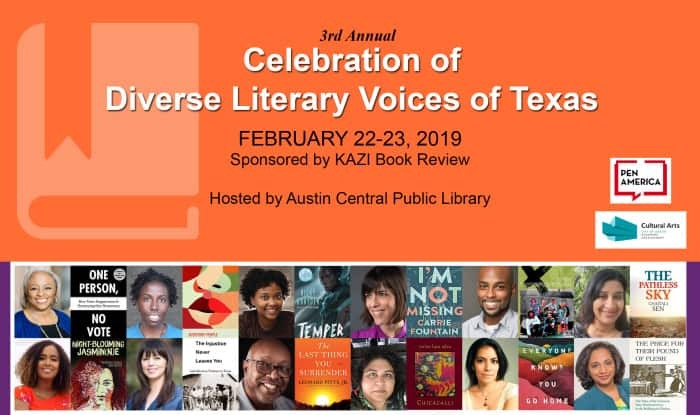 PEN America is pleased to be a presenting partner for the Third Annual Celebration of Diverse Literary Voices of Texas sponsored by KAZI Book Review, hosted and cosponsored by Austin Central Library, with support from the Cultural Arts Division of the City of Austin Economic Development Department. The festival begins with a special Black History Month panel discussion of the posthumously published book from Zora Neale Hurston, Barracoon. It will also feature panel discussions with authors discussing their perspectives on the representation of current issues in the news and media, including “The Role of Press in Safeguarding Democracy” with 2019 PEN/John Kenneth Galbraith Award for Nonfiction finalist Carol Anderson, author of One Person, No Vote: How Voter Suppression is Destroying Our Democracy, and Professor of African American Studies, Emory University; Gary Bledsoe, President, Texas NAACP and Interim Dean, Texas Southern University School of Law; and Alberta Phillips, Austin writer and journalist. Another panel, “The Depiction of Immigration in Fiction and the Media,” will include Douglas Criss, Digital Trending News Writer, CNN; Leonard Pitts, Jr., nationally syndicated columnist for the Miami Herald and author of The Last Thing You Surrender; Chaitali Sen, PEN America Member and author of The Pathless Sky; and Natalia Sylvester, author of Everyone Knows You Go Home.